October 19, 2017 at 8.00 a.m.
Today, Vaisala announced a new project for a collaborative research and demonstration environment concerning air quality in China. 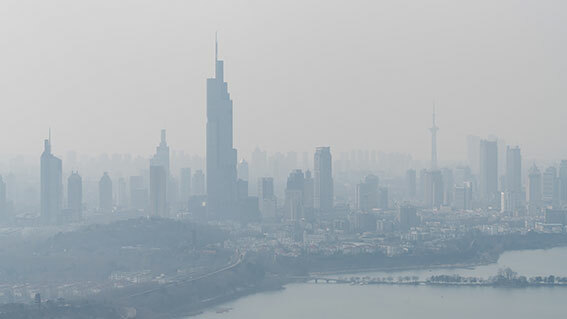 The company builds a dense air quality observation network in the megacity of Nanjing and the Yangtze River Delta in 2017-2019. The air quality services and applications developed in the project will be crucial for local air quality forecasts. They provide tools to better understand the complex air quality environment in China, and accomplish novel 3-D air quality modelling thanks to fusing observations from diverse instruments. The project advances several new growth areas in ambient air quality monitoring: supplementary air quality networks, remote sensing for vertical pollutant profiling, advanced air quality modelling and nanoparticle monitoring. The key technologies have been developed in Finland and are now piloted in the demanding conditions of China. Vaisala has the lead in the project - in collaboration with the University of Helsinki, Finnish Meteorological Institute and later also with partners in China. The pilot will be built around University of Helsinki and Nanjing University collaboration in research station, SORPES, which provides a unique platform to test different versatile instrument set ups for air quality monitoring in Nanjing, China. Air quality is a growing health problem around the world. More than 80% of people living in urban areas are exposed to air pollution levels that exceed WHO limits. According to the most recent WHO assessment, approximately 7 million people died prematurely because of air pollution in 2012. While all regions of the world are affected, people in densely populated and highly polluted megacities are impacted the most. "Being able to measure pollutant concentrations in a dense network and applying modern modelling tools to this data make it possible to deliver air quality forecasts, which are far more meaningful and relevant for the citizens than those currently. Further, it will enhance the capabilities of authorities and decision makers as well as consumers to undertake more meaningful actions timely. Having a proof of concept for this type of network in a Chinese setting will be a requirement for successful novel business build for Air Quality networks," says Jarkko Sairanen, Vaisala EVP for the Weather Business Area. The adverse health effects of air pollution are caused mainly by aerosol particles suspended in the near surface air, with additional contribution coming from trace gases like ozone. Concentrations of aerosol particles have increased considerably in China over the past decades, and the most populated regions have experienced frequent and severe air pollution episodes in recent years. "The dense air quality network in Nanjing will be complemented with vertical atmospheric Vaisala LIDAR (Light Detection and Ranging) profiling devices. Vertical profiling of atmospheric pollutants is currently possible in a limited fashion only by using very expensive remote sensing apparatus, the use of which is limited only to research purposes," explains Sairanen. Therefore, one important outcome of the project will be the concept for a next generation air quality station, with a capability to add a vertical component to modelling. "With this vertical component we are able to provide a 3-D model of the local air quality, helping the customer to understand the local air quality more profoundly and thus make better informed decisions. We see great global potential in being able to combine this type of a comprehensive solution in the future", concludes Sairanen. On the one hand, the global growth of the air quality market is driven by the megatrends of urbanization, population growth and health consciousness and on the other by new sensing and Internet of Things (IoT) technologies that open up completely new concepts for monitoring and business. The most significant geographical region regarding air quality is expected to grow in Southeast Asia and China, in particular. Finnish Funding Agency for Innovation, Tekes, has granted Vaisala funding for the project.